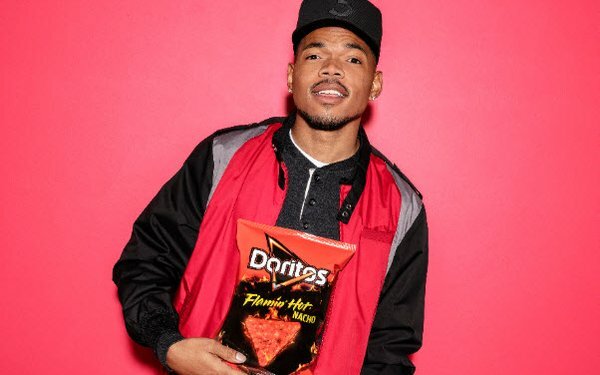 Doritos has announced that it will be running a Super Bowl ad featuring Chance the Rapper, which will promote the brand’s new Flamin’ Hot Nacho variety. PepsiCo last week announced that Doritos, Pepsi and Bubly would all have 30-second ads in the game this year, and that Goodby, Silverstein & Partners is the lead creative agency for the ads. But it’s apparently planning to trickle out pieces of information about the ads’ creative. The company offered no further specifics about the Doritos ad today. In last year’s Super Bowl, PepsiCo ran back-to-back 30-second ads for Doritos Blaze and Mtn Dew Ice (also from Goodby), respectively starring Peter Dinklage and Morgan Freeman. Those well-received ads also featured hip-hop performers. The Doritos spot was backed by Busta Rhymes’ cover of Chris Brown’s "Look at Me Now,” and in the Mtn Dew ad, Morgan Freeman lip-synched to Missy Elliott's funky hit "Get Ur Freak On."